CAMI Research Inc. (Acton, MA) announces a new board for its CableEye cable and harness testing systems. Populated with precision resistors, it allows users to determine empirically whether the tester requires calibration. The CB50 may be used on all CableEye models. A leader in development of PC-based Cable & Wire Harness Test Systems for over 20 years, CAMI offers the CableEye suite of Low and High Voltage products complete with accessories including connector boards. The CB50 attaches to the tester like a regular connector board. When checking expansion modules, the board can be connected directly or via an extension cable. 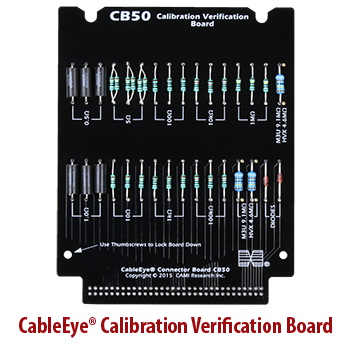 Sold as a SINGLE board, the CB50 contains a network of precision resistors for checking resistance, and two diodes for checking diode polarity. Ten different resistance values are checked in triplicate at each of the tester header’s 64 test points. The values span the entire test range. The CB50 is configured to verify model M3U, while the CB50H is configured for models M3UH, HVX, and HVX-21. The CB50 is intended for periodic verification of tester calibration. To ensure that resistance measurements remain accurate, CAMI recommends yearly calibration. However, depending on environmental conditions and usage, testers may need calibrating more or less frequently. Certain components within models M3U, M3UH, HVX, and HVX-21 (i.e. those capable of measuring resistance) are analog components whose characteristics change slightly over time. This aging is a natural phenomenon common to all electronic components and may cause resistance measurements or gradually deviate from normal. A tester that is out of calibration will give inaccurate results. Some (maybe all) resistance measurements will be incorrect. Consequently, it may Pass what should Fail and, conversely, Fail what should Pass. In other words product yield will be contaminated due to unreliable quality. Companies interested in quality product and maximum yield will ensure their testers are calibrated. Those with quality certifications such as six sigma or ISO9001 will be required to calibrate. The CB50 will allow these quality-focussed companies to optimally determine when calibration is necessary and to schedule accordingly. Customers may purchase a kit to calibrate the tester themselves, or send the tester to CAMI for calibration. Connector boards are included in CableEye’s standard, renewable one-year warranty of the tester for which it was purchased. The warranty covers replacement of worn connectors and cleaning of connector boards. Available immediately, a CB50 is $195 (Item 780), and a CB50H is $205 (Item 780H).